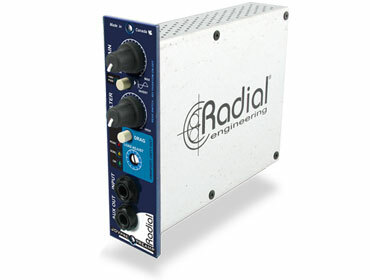 The Radial JDV-Pre is a unique preamplifier designed specifically to capture the natural tone and distinct character of the instrument. This may sound like another 'marketing line', but unlike mic preamplifiers that are centered on 'the microphone', the JDV-Pre is completely focussed on the various types of pickups used and transferring the signal without introducing distortion or artefact of any type. The design begins with a 100% discreet class-A amplifier for optimal signal transfer. But unlike all other amplifier designs, the JDV-Pre's front end is completely void of negative feedback loops to stabilize the circuit. This revolutionary design eliminates the use of phase-cancellation which inevitably degrades the signal. This is augmented with Drag Control™ load correction that allows the engineer to precisely adjust the load on the instrument pickup as if connected to a tube amp for a more natural rendering, no matter what type of pickup is employed. The quest for perfection does not stop there. When the impedance is set to optimize the sound of piezo pickups, the JDV-Pre remains unbelievably quiet. Accustate gain control not only allows complete freedom over the signal path, but retains the signal-to-noise ratio at all levels. Acoustic instruments are further advantaged with a fully variable high-pass filter that gently rolls of the low end to eliminate troublesome body resonance while allowing each instrument to sit more comfortably in the mix. To address instrument microphones, a balanced mic input with available 48V phantom is equipped with a vintage style Hammond Broadcast transformer. This combines the warmth of old-school electronics with the natural compression of transformer saturation as the signal is driven hard. Natural sounding, transparent and remarkably quiet, the JDV-Pre is without a doubt, the finest instrument preamp ever presented in a 500 series module.